Chocolate Chip Pumpkin bread is a great way to use that pumpkin that you kept in your freezer from last Fall. It adds some extra nutrients into the bread that no one will even know about, unless your kids are into cool stuff like that. I pureed the pumpkin I had from my garden last year. They were not huge since our growing season is shorter here, but it was enough that I have quite a few bags in the freezer. The chocolate chips made this more like cake, but hey, we aren’t complaining! It is very moist and super yummy. If you like, you can even take the sugar down to 1/2 cup or even 1/3 cup to make it more of a lightly sweetened coffee cake. 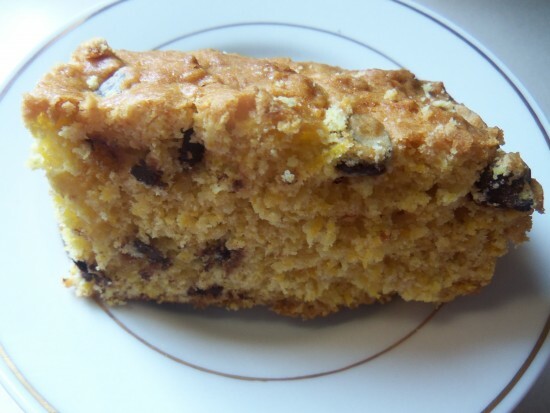 This is my favorite versatile recipe that I use for sweet breads with fruit. See also Blueberry and Banana Bread. I made a double batch and it was gone by the next morning! Cream butter, sugar, and egg in a large bowl (If adding other fruit or chocolate chips, fold in at the end). Pour into a greased a 9in x 9in dish and bake at 350F for 30 min. Remove when toothpick comes out clean. People process their pumpkins in many ways. My favorite is to just cut the pumpkin so that it can fit in my oven. You can scoop out all the seeds now and set aside for roasting (See this post for a great recipe) or wait until it’s cooked. I think it’s easier before hand because the seeds aren’t getting lost in the mush. Then I place the chunks into a glass dish or jelly roll pan with an inch or so of water in it. You can also put a dish with water in it on a lower rack if you have room. Bake at 280 until it is very tender. Let it cool, peel away the outside and compost. I put my cooked chunks into a blender, blend, and then measure out 2 cups into zip close bags. A lot of recipes call for around 2 cups. This saves time later. Then I put it all in the freezer. That’s it! Pumpkin and chocolate– I know a lot of people who would like to share a loaf of this with us. Looks delicious! thanks.